Susan Scott comes from a family where education matters. Her siblings are college graduates; her mother held a Ph.D. from Oxford. Finally, Scott, 60, is a college graduate, too. She will earn her Associate of Science in Social Sciences on May 8 during TCC commencement at the Ted Constant Convocation Center. After high school, Scott wanted to major in anthropology. Her mother said no. “During that time with African-American women, you could be a secretary, a teacher, something of that nature,” she said. Scott picked nursing. The classes didn’t deter her, but the clinical setting did, and she dropped out of school prior to completion. “My mother stayed mad at me till she died,” Scott said with a laugh. The nursing skills proved handy, though, as Scott tended to the older relatives in her family when they aged, even donating a kidney to her mother in 1995. Her occupation became coding claims for Medicare. Scott also had an ailing father to care for. She was worn out mentally and unsure whether she had the aptitude to return to school after decades of being away. Math stumped her. She started with remedial math and graduated to algebra. Scott lists Orlando Stone, Lawrence Singleton and Thomas Smith as three of the best teachers she’s ever had. She is especially grateful to interim dean Bertha Escoffery and provost Michelle Woodhouse. “Without Dr. Woodhouse, I know I would have dropped out,” Scott said matter-of-factly. Her daughter, Jasmine, who will graduate from Wilson High on June 7, is also an inspiration. Along the way, Scott became a mentor to others. 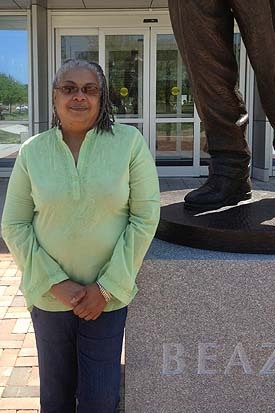 Everybody knows her as “Honey” on the Portsmouth Campus, and it isn’t unusual to see her editing student essays, red pen in hand – English skills learned from her mother. “Before I leave here today, I’ll have 99 different hugs,” Scott said, sitting alongside the Fred Beazley statue on the quad. Scott plans to enroll in a non-licensing teaching program at NSU. She has a vision of helping elementary school children better prepare for middle school both academically and socially. She wants “Honeybees” to be a place where parents can bring their children struggling with homework or other issues. First, she plans to enjoy her moment on Wednesday. Engineering student rewarded with ODU’s modeling and simulation transfer scholarship.